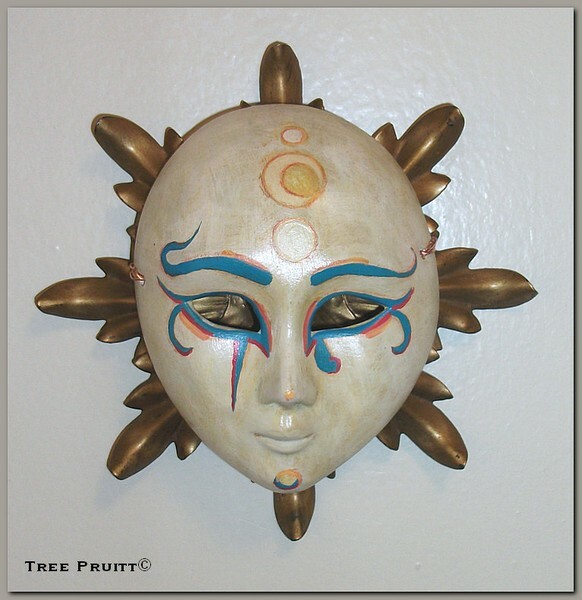 Star Child is a mystical wall hanging art assemblage with a painted re-claimed ceramic mask and vintage metal decor accent for a shamanic ancient aliens style creation. In symbolism leaf shapes from the metal piece point to the eight spokes of The Wheel of the Year, denoting the seasons of Earth. The sturdy golden metal piece rests behind the mystical mask that also alludes to Crop Circle Signs in it's hand painted decoration. Artist Reply: My thanks indeed! I'm glad you enjoy it! Artist Reply: Thanks so much Ruth! Glad you like it!